Each year in June, Cherrydale neighbor Scott Springston spearheads organization of The Great Cherrydale Yard Sales, a chance for all Cherrydale neighbors to clean out their garages, basements, playrooms and attics and make a bit of money in the process. It's a terrific community event and a huge service to all. Hats off to Scott! 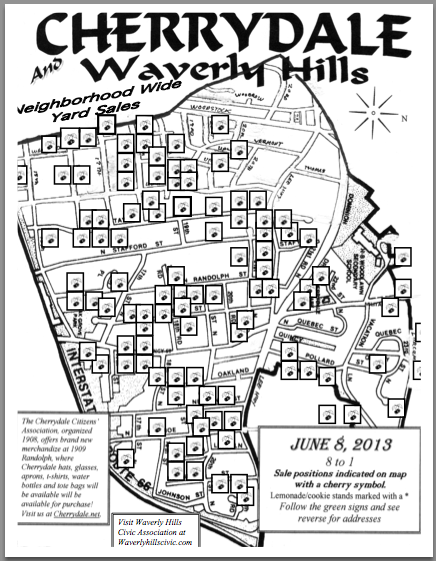 Participating neighbors pay a nominal fee (in 2013 it was $5) to get their yard sale listed on the yard sale map (as an example, see the 2013 map, below). The map (with addresses on the reverse side) is available on this website a few days prior to the yard sales, and copies are available at each yard sale location. Lemonade stands are listed on the map for free.